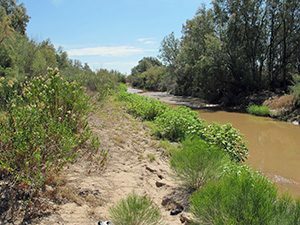 The inland delta of the Santa Cruz River in Pinal County is a largely overlooked agro-ecological system with unique treasures. Author and biologist David Brown will lead this field trip. Stops will include the old Greene Reservoir, some extraordinary birding sites, and the Sasco area. Doug Jenness will help identify birds and explain the wide avian diversity produced by the agricultural environment. 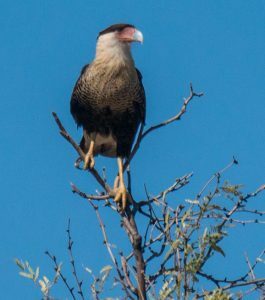 Highlights for birders on the Santa Cruz Flats may include Crested Caracaras and Mountain Plovers. Botanist Elizabeth Makings, Curator at Arizona State University’s herbarium will share her vast knowledge of desert and wetland plants. Registration is required. Please email Cindy.Zisner@asu.edu with your name, email, and how many attending The limit will be 25 so register early. From Phoenix or Tucson: Take I-10 and exit Sunland Gin Road (Casa Grande). Look for Love’s Travel Stop, 5000 N. Sunland Gin Road. This is on the southeast side of the intersection of I-10 and Sunland Gin Road. Meet on the south side of Love’s gas station parking lot before 8:30 a.m. Carpooling may be arranged on site. Get there early and eat at the restaurant across the street; it serves a pretty good breakfast. Bring water and snacks or sack lunch, as we will return in the afternoon. Please dress appropriately for field trip conditions that could include mud, stickers, rocks, water, reptiles, insects, blowing wind, dust or sun. Any type of motor vehicle is appropriate. We will be on paved or well-graded, maintained dirt roads.